Sometimes, you don’t expect much more from a film than you can get from a cursory glance at said film’s box art: in this case, I expected Jeff Renfroe’s The Colony (2013) to be a serviceable sci-fi/action flick, set in a frozen, dystopic future, with Laurence Fishburne and Bill Paxton butting heads…nothing more, nothing less. For the most part, this is exactly what I ended up with: while the film throws a few minor twists into the mix, nothing here will be unfamiliar to viewers who’ve seen films like Screamers (1995), Doomsday (2008) or any of a hundred other similar sci-fi/horror/action hybrids. That being said, The Colony is fast-paced, reasonably tense and features a handful of truly impressive fight sequences: if the film ends up being rather silly and over-the-top, in the end, it at least manages to keep the courage of its convictions. We’re immediately dumped into one of those frozen-over worlds of the near-future that forms such an integral part of recent sci-fi films like Snowpiercer (2014): in this case, we’re not given any real reasons for the catastrophe, although a handy voice-over does let us know that the common cold is now a lethal killer, which positions this somewhere between climate change and bacteriological devastation on the “We’re Fucked” scale. Regardless of the reason, humanity has been split into two separate groups: the ones who made it underground, to protected colonies, and the ones who stayed above-ground. To make it even easier: underground = alive, above-ground = dead. Suffice to say, the future ain’t such a hot place to be, in every sense of the term. Our entry into the narrative is Colony 7, one of the last, surviving colonies. Run by the even-handed, level-headed Briggs (Laurence Fishburne), the colony is also home to hot-headed, reactionary Mason (Bill Paxton), proving the old film adage that everyone needs an antagonist, especially those who lead post-apocalyptic societies. Our narrator (and defacto hero) is Sam (Kevin Zegers), a nice, upstanding young man who happens to be sweet on Kai (Charlotte Sullivan), the tough-as-nails supply controller who’s more than capable of taking care of herself in an unforgiving world. Life in Colony 7 is harsh and violent death is always around the corner: any residents who develop the sniffles are given one of two options – let Mason put a bullet in their noggins or take a long, cold walk into the oblivion of the snow-blasted wasteland above-ground. It’s not, exactly, how Briggs would prefer to get things done but it’s a balance that works, for the time being. After a short series of adventures through the CGI-created frozen world that used to be ours, our trio ends up at Colony 5, only to discover what appears to be the remnants of violent conflict. Upon further exploration, the trio finds a single survivor, Leland (Julian Richings), who spins a tale that begins hopefully, with a potential thawed zone on the surface world, and ends horribly, with news of some kind of attack that wiped everyone out. Since our heroes really can’t leave well enough alone, they continue to explore Colony 5 and run smack-dab into a rampaging horde of bloodthirsty cannibals led by a leader (Dru Viergever) who manages to be a teeth-gnashing, chest-beating amalgam of pretty much every savage/feral/cannibal/evil warlord leader in the history of dystopic cinema. This then begins a protracted chase, as our heroes must return to the safety of their colony while being careful not to lead the cannibal army directly to their next smorgasbord. Who will survive and who will become toothpicks? In this colony, it’s anyone’s guess! For the most part, The Colony is a pretty run-of-the-mill, bargain-bin type of dystopic action flick. 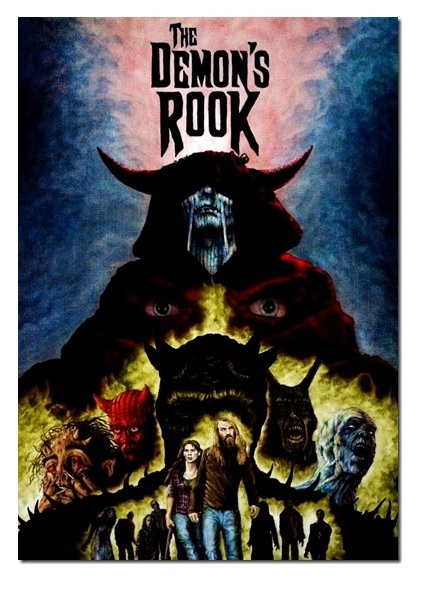 It’s got all of the visual and aural hallmarks of said subgenre (morose score, muted color palette, panoramic wide shots), as well as many of the pitfalls (extremely dodgy CGI, extraneous use of slo-mo and overly flashy editing, over-the-top acting). The cannibal angle isn’t so much a twist as an inevitability and this particular iteration of feral savages is much less interesting and singular than, say, the flesh-eaters of Doomsday, who at least had the foresight to barbecue their victims with an industrial size backyard grill. Here, we just get the typical filthy, snarling, rampaging cannibal Berserkers, albeit with the added lunacy of watching them run around in snow gear. If it sounds silly, it is but no more so than many films of its ilk. For their part, the non-cannibal actors turn in fairly workmanlike performances, with both Fishburne and Paxton all but fading into the background. Paxton, in particular, seems to be moving on auto-pilot: I expected at least a little gonzo nuttiness but his performance was surprisingly subdued and more than a little grumpy. Zegers and Sullivan make a blandly attractive couple as Sam and Kai but there’s not much spark to their turn, while the rest of the colony passes in a blur of rather similar, generic characterizations. In truth, there are only two ways that The Colony really distinguishes itself: the computer-designed backgrounds, prior to arriving at Colony 5, are astoundingly fake and the film is surprisingly violent and brutal, even for a post-apocalyptic fable about rampaging cannibals. The violence isn’t really an issue, since I doubt that any shrinking violets in the crowd are going to be drawn to a cannibal film, but it is certainly impressive: there’s one setpiece, involving cutting someone’s head in half, that’s gotta be one of the most bravura effects spectacles I’ve seen in a while. The excellent gore effects are made even more noticeable by contrast to the awful CGI, which seems to exist at a sub-mockbuster level. There’s never a point where the backgrounds look like anything less than a green screen: in one particularly egregious moment, the trio walk into the cheesiest CGI fog that has ever been committed to screen and I’ll go to my grave believing that. I can deal with dodgy SFX: growing up on Corman flicks has a tendency to lower one’s inherent expectations regarding B-movies. The CGI work in The Colony is so rudimentary, however, that it’s all but impossible to suspend disbelief anytime our intrepid group is outside (which is often enough to be a huge problem). Once we get to Colony 5, the film actually doesn’t look bad: close quarters seems to suit the filmmakers better than the wide-open, fake vistas of the surface world. The trip there, however, leaves a bit to be desired. 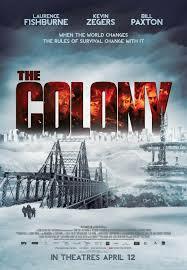 Ultimately, The Colony isn’t a bad film, although it is a cheesy, largely predictable one. While Fishburne and/or Paxton fans might be a little disappointed at the disposable performances here, fans of dystopic future, cannibal or “frozen world” scenarios might find at least a little something to sink their teeth into. Think of this as a poor man’s version of Snowpiercer (extremely poor, mind you), minus any of that film’s political or sociological significance: if that’s up your alley, pack your long johns and head for The Colony. Otherwise, you’d probably be better off just hibernating until spring.